Larry Norman arrrived in B.C. in 1984 fresh out of high school. He quickly settled in Cultus Lake and fell in love with slalom paddling on the Chilliwack River. Two Olympics, one medical degree and and many amazing memories later, he's still paddling and introducing whitewater to his own children. Here is Larry's paddling story in his own words. I first traveled to B.C. in the fall of 1984, after finishing high school. After a short stint teaching kayaking at Strathcona Park Lodge on Vancouver Island, I ended up in Cultus Lake (near the Chilliwack River). At the time this was the primary training site for the National Slalom Team. That first winter there set the hook for what was to become a huge part of my life. There was no formal organization of any kind. But for several years, it had become clear that this was the place to go if you wanted to do what my early mentors, like C2 paddlers McCaffery and Brown, advised “Train Hard/ Get Good”. I was back in Ontario the following year for university but soon returned to the Chilliwack River to learn and train and qualified for my first National team in 1987. I made the Chilliwack River my home for the next 13 years, living in various arrangements including unheated cottages, a 1977 Camper van and even a treehouse for a season. In the first few years we were largely self-coached, though 1972 Olympic team member Eric Munshaw would come down to the river and help us hang gates to practice on and coach us from time to time. Eventually our first full time National team coach Mike Druce was hired and based in Cultus Lake. In those years my primary focus was racing slalom. I did manage to complete a degree at SFU along the way. Some of that was done by compressing my classes into three days a week, when I would live in the SFU parking lots on Burnaby Mountain in my camper van, study in the library, shower in the gym, and then return to the river to paddle the rest of the week. There was a small but surprisingly dedicated crew of whitewater slalom paddlers who had assembled in those years, both from across Canada and, for several years, the USA. At the time, the Chilliwack River, specifically the Tamihi rapid was a really great place to train. 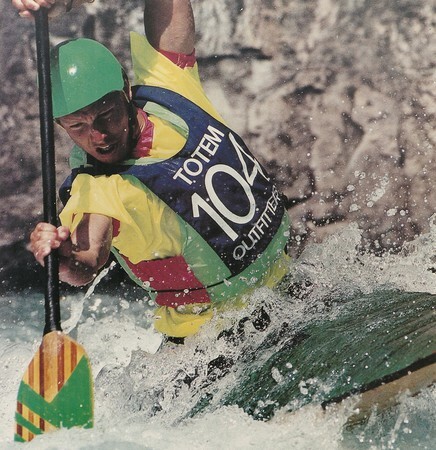 Despite the ongoing challenges to maintain gates through cycles of floods, it was fantastic whitewater, and was a destination for many of the world’s best to train in winter. I competed for Canada at the 1992 (Barcelona) and 1996 (Atlanta) Olympic Games, placing 19th and 18th respectively, as I said at the time…steady progress! I won several National Championships in both C1 and C2. Then in 1998, while recovering from an injury, I filled in for a race tour in Europe as National Team Head Coach. The following year I started medical school at UBC. I left B.C., a bit reluctantly, in 1999 to finish medical school in Ottawa. I qualified one more time for the National team in 2001. I now live in Ottawa with my wife (who is from Chilliwack) and my three children. I still paddle most days when the water isn’t frozen (on those days I ski). In the last several years I have taken up SUP river surfing. My kids are learning to paddle whitewater at our small summer cabin on the Ottawa river. I work as an ER Doctor at The Ottawa Hospital and sometimes slip into my slalom boat for a few runs while my daughter trains at the course we have here in town. A brief follow-up from Larry after sending the above and reading what his cousin Dan Norman wrote. It’s easy to read though, without appreciating what a lark it all was. I’m not sure I shared your (Dan’s) early confidence that we were going to reach the highest levels. I do remember though laughing our heads off driving overnight to a race in South Bend, Indiana from Minden at 40mph with the heater on full despite the sweltering heat in your car with a busted radiator. I don’t recall if that was the same car we wrapped the tomato juice can around the exhaust to get to the Petite Nation river. I know it wasn’t the Ford Maverick, which never made it out of B.C. after rolling down the hillside coming out of Cultus and we drove around for the rest of that winter with googles and no windshield. It wasn’t just the cold river that made us all need to sit around the tub and soak our frozen gear off after a session after all. It was a fine time. I also was reminded how much we leapfrogged each other. I’d have never heard of slalom if you and Jim (Cartwright) didn’t come back from MKC (Madawaska Kayak Centre) all fired up about it. And I think the Chilliwack Centre of Excellence was started from a collection I took up in a peanut butter jar to pay for some gate materials after losing half the course in a fall flood. If perhaps we did not see as far as some, if may have been that we stood on the shoulders of each other, and neither of us is very tall ; ). As Olivia (Larry’s daughter) paddles and gets into slalom, I find myself watching to see who is around her and how she will progress. Who will be her Ian Edwards and Jim Coffey who will get their mom’s car and gather everyone to the river on a snowy spring day. Who will be her Bing and Bong, who are cannon fodder for ridicule but despite that are solidly supportive. Who will be her Mike Elrick who can show her how it’s actually supposed to be done? Of course, the answer is that the questions are ridiculous. Slalom has changed and the world has changed, she will find her own path as we did. What hasn’t changed is the look on her face when she catches a good wave, nails a smooth up or crosses a finish line spent.